/ Главная / Russkiy Mir Foundation / News / What do foreign students want to know about Russia? 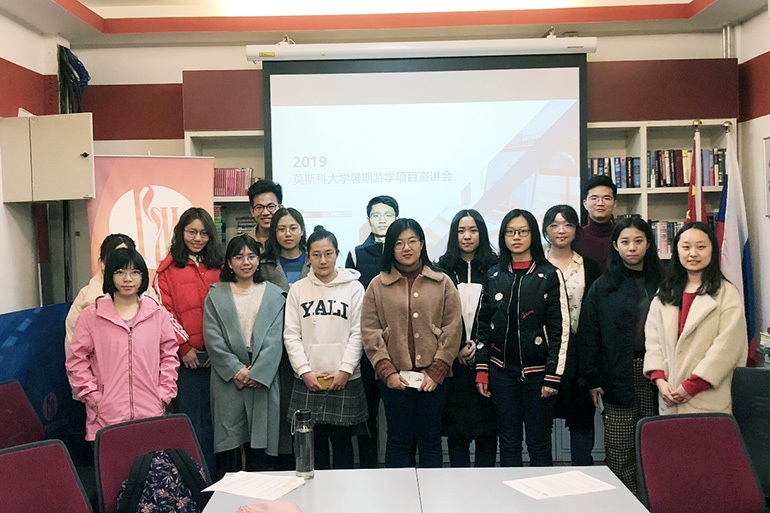 A meeting dedicated to the exchange of experience in studying in Russia was held at Russian Center of Beijing Foreign Studies University ​​(BFSU) on March 10. First and second year students attended the event. The speakers were undergraduates who recently returned after their internship in Russia. The speakers prepared interesting photos and videos taken during their stay in Russia. Undergraduates shared their experience of how to adapt in Russia quickly, and provided useful information about everyday life. In particular, they gave future trainees valuable advice on the difficulties that foreign students most often face and ways to avoid them. The event aroused great interest among younger students, because the language environment is very important for increasing the level of proficiency in Russian among foreign students. After the story, junior students talked with undergraduates and asked them questions regarding their future internship in Russia. They are especially interested in choosing the right university, curriculum and cultural differences between the two countries.